Green River Hole 3: This is a short par five, straight and generally not much to remember, except for the fact that it runs along a very active train track on the left side and a pulled shot could actually strike a locomotive. I'm not recommending that option, though, especially due to the OB penalty strokes that come a long with it. Beware also the horn happy train engineers as they drive by, as they can time it in your back-swing. Green River Hole 6: This is a dogleg left around a solid growth of trees. The drive that goes too far can find a "creek" crossing the fairway, but that's unlikely for most. The slightly uphill green complex has expansive bunkers to the right side, so that is the mistake to not make. 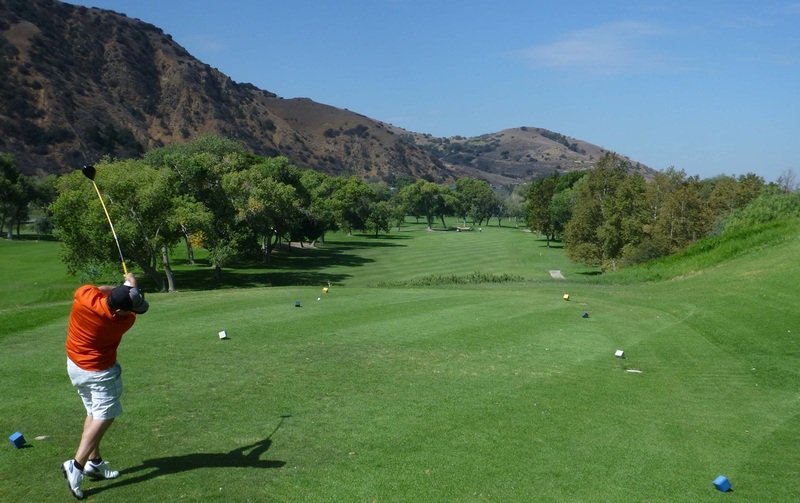 Green River Hole 7: This is a fun par 5 with the hills of Corona as the backdrop that run along the left side of the hole. A large lake (depending on time of year, the lake maybe devoid of water, but is still a hazard) dominates the right side of the hole and comes into play on the drive and second shots. The fairway is wide enough that the lake can be avoided, but the gutsy drive that hugs the right side opens up the opportunity to go for the green in two. Green River Hole 9: The most challenging hole on the front is this long, straight par four. The drive is relatively tight with trees on both sides and there is a lake (seasonally dry) down the right side on the tee shot. Green River Hole 10: Formerly a short par four, this hole has now been turned into the beast of the course. 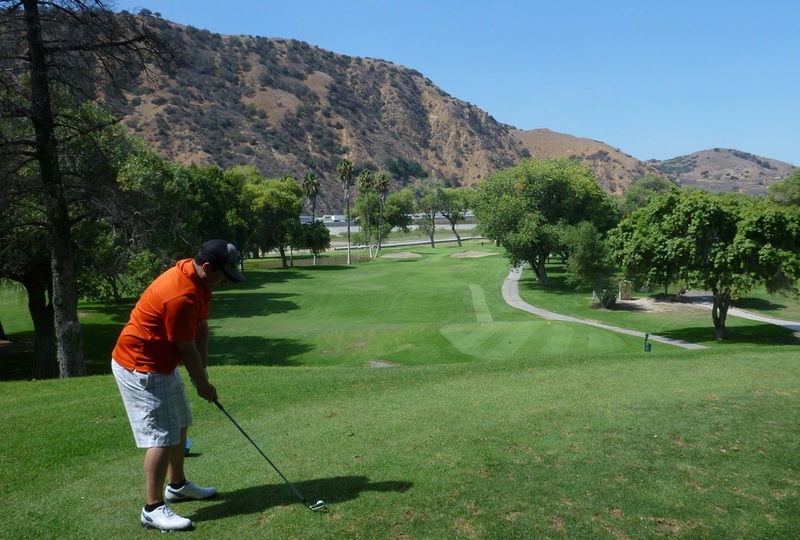 At over 460 yards, this dogleg left has trees and OB left more trees right. After a needed long drive, the approach is to a long and narrow green. Green River Hole 14: From the elevated tee box, the view of the hole lays itself in front of you. 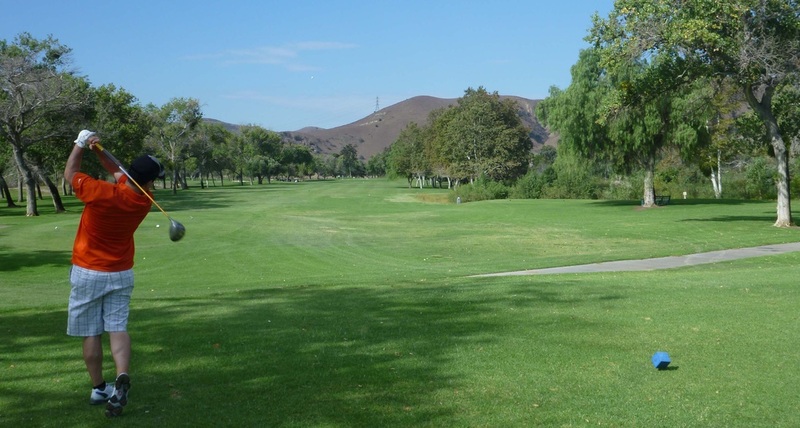 This is a pleasant, relatively straight par four, and if the trees can be avoided, one that is relatively accessible for scoring. Green River Hole 15 (left): From the back tees, the drive is tight and through two large "guardian" trees on either side of the fairway. Getting through those is mandatory for any score. Beyond that, the hole doglegs left around more large trees to a wide green with a tier in its middle. Green River Hole 16 (below): The one hole on the course that gets the adrenaline rushing for sure is this downhill par three. At 200 yards from the tips, and usually into the wind, the lake to the left seems very unfriendly, but all too eager to be visited. The bunkers nearby seem almost a welcome landing area as the ball will hover in the air a long time. Any shot finding the green should be congratulated. Green River Hole 14 (old Riverside Course): This was a great golf hole (the only one I'd give that distinction at the former Riverside course of Green River) from tee to green, which made me sad when it was demolished to make way for some "infrastructure". 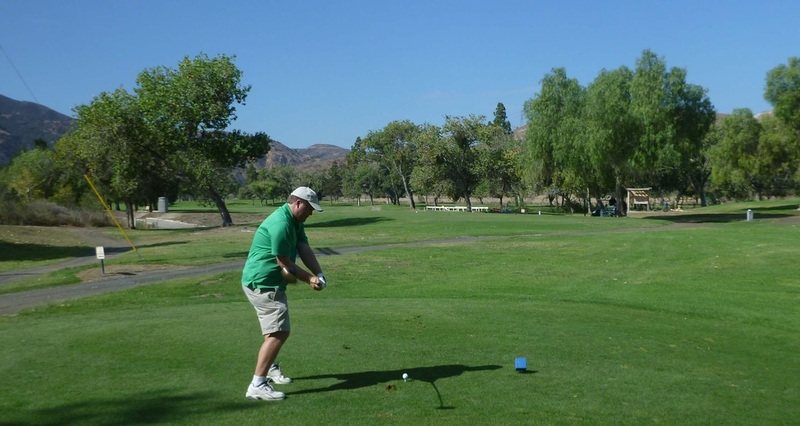 The drive was played through a shoot of trees to a tight fairway. Anything pushed right would either leave a blind approach to the green or would find the Green River. Anything left presented a long approach on the dog leg right. The ante was upped as the Green River crossed in front of the green and did not leave much room for error for front pin placements. Thus, the shorter approach shot was much preferred on a second shot that would get the adrenaline pumping for sure. 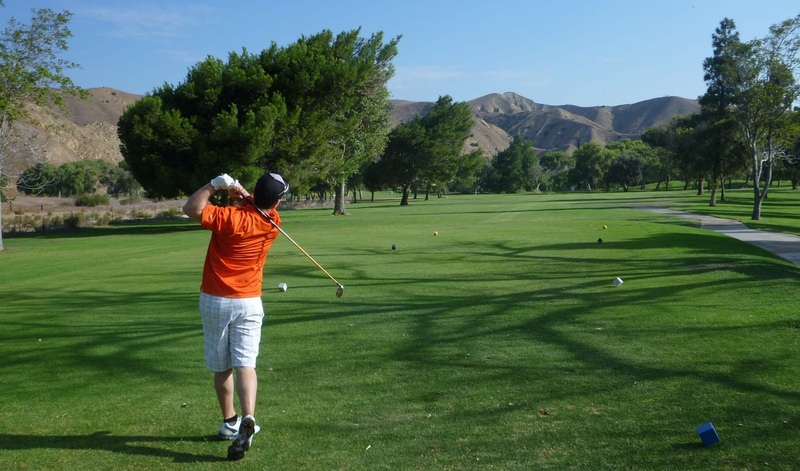 More Inland Empire Golf Reviews.